President Trump visited Puerto Rico, where 16 people are known to have died as a result of Hurricane Maria. WASHINGTON — President Trump ventured on Tuesday to a storm-ravaged American island territory where residents have felt neglected by their government, telling Puerto Rican officials that they should be proud that only 16 people were known to have died in Hurricane Maria. Shortly after Mr. Trump departed the island, Governor Ricardo Rosselló told a news conference in San Juan that deaths related to Hurricane Maria had risen to 34. Except for that sad adjustment, the trip marked a well-worn routine for a president on his fourth visit to a disaster zone in two months: a pep rally-like briefing with officials in an aircraft hangar, a quick drive past twisted houses and uprooted trees and a brief, friendly encounter with victims of the destruction. 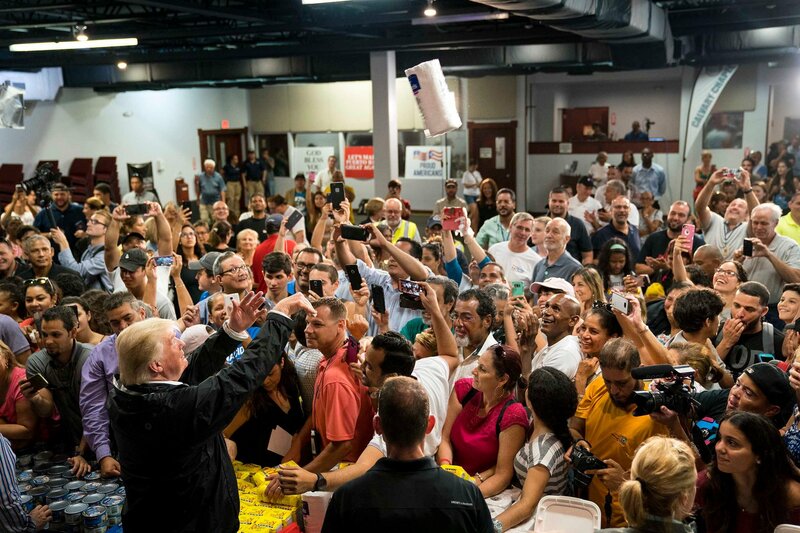 And like his earlier travels, it had its peculiar moments: He also gently tossed rolls of paper towels into a crowd that gathered to see him at Calvary Chapel, outside the island’s capital, San Juan. This time, however, Mr. Trump flew into a different kind of turbulence. Over the weekend, the president lashed out at the mayor of San Juan, Carmen Yulín Cruz, after she complained that the federal response in Puerto Rico had fallen short of the responses in Texas and Florida. She was not mollified after meeting him. Mr. Trump greeted the mayor but did not invite her to speak, recognizing instead Mr. Rosselló, who the president said “did not play politics,” and Puerto Rico’s congressional representative, who lavishly applauded the administration’s performance. 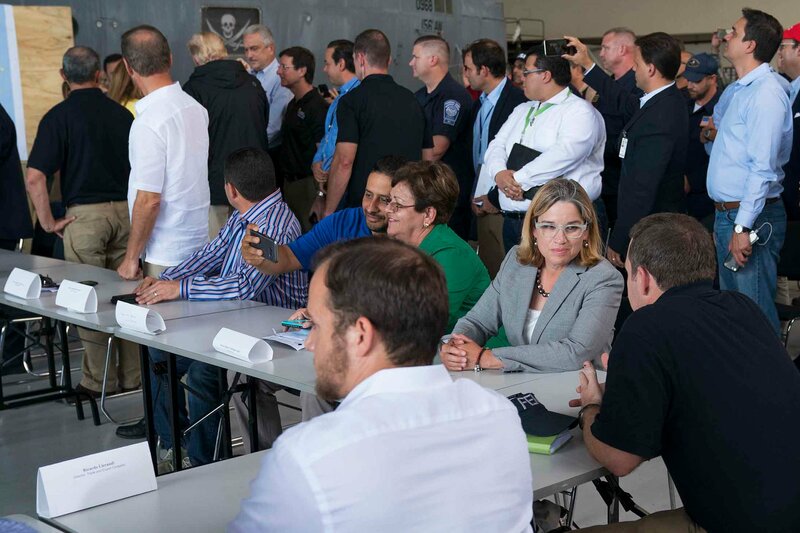 “Thank you, Mr. President, for all you have been doing for the island,” said Jenniffer González-Colón, the territory’s nonvoting representative, who declared that Washington had sent everything Puerto Rico needed. The president then went around the briefing table, praising the director of the Federal Emergency Management Agency, military commanders and a half-dozen members of his cabinet who accompanied him to Puerto Rico — which was already facing about $74 billion in debt even before the hurricane hit. Before leaving the White House on Tuesday, Mr. Trump told reporters he believed Ms. Cruz was now mostly satisfied. White House officials were nervous that Mr. Trump would be set off again if he were greeted by protesters in Puerto Rico. As late as Monday afternoon, some aides were urging the president to delay the visit, which came a day before he was scheduled to fly to Las Vegas to meet with law enforcement officials and victims of Sunday’s mass shooting there. There were a few other signs of discontent on Tuesday. As Mr. Trump’s motorcade drove from an air base to a church — passing hundreds of downed trees — it also passed a woman clutching a placard that said, “You are a bad hombre,” according to a pool report. President Trump said Puerto Ricans should be “proud” of the low death toll after Hurricane Maria. But a tour of the island by New York Times reporters showed that vast humanitarian and logistical challenges remain. “Let him come so he can see what there really is, and so nobody can tell him made-up stories,” said Mr. Vega, an accountant. Outside a bar in the Santurce neighborhood of San Juan, an hour after Air Force One departed Tuesday afternoon, people debated what Mr. Trump’s visit might have accomplished. Even before the death toll was increased on Tuesday evening, others noted that the actual number of people killed by Hurricane Maria may rise significantly, given that the earlier, certified tally was outdated and that the island government’s record-keeping ability has been damaged by the storm. Mr. Rosselló said 19 of the total 34 deaths so far were directly related to the storm, like drownings. The others included electrical failures of oxygen tanks, suicides and natural causes like heart attacks, he said. Others were more concerned about the reconstruction of the island and their own precarious situations than Mr. Trump’s comments. Still, others seemed happy just to have the president in their midst. In a 20-minute visit to Calvary Chapel, an English-speaking evangelical church that has become a collection center for supplies, Mr. Trump shook hands, took selfies and offered encouragement in the chapel’s sanctuary. Mr. Trump boarded a Navy amphibious assault ship for meetings with the governors of Puerto Rico and the United States Virgin Islands. The White House asked the Virgin Islands’s governor, Kenneth E. Mapp, to fly to Puerto Rico because of the logistical complications of flying the president to those islands, parts of which have been severely damaged. Mr. Trump has gotten used to being a kind of second responder, having traveled to Texas and Florida after two other hurricanes over the past two months. Since the weekend, Mr. Trump has sharply scaled back his Twitter posts about the hurricanes or other potentially charged issues. But speaking to reporters on Tuesday, he continued to emphasize the government’s performance rather than the plight of the victims.